Wolf Commercial Real Estate, a premier Cherry Hill commercial real estate brokerage firm with expertise in Cherry Hill commercial real estate listings and services, is now offering Cherry Hill office space for lease at 111 Woodcrest Road Cherry Hill NJ. This Cherry Hill professional office space for lease is a sub-lease opportunity with a lease term that expires 11/30/2019. There is approximately +/- 6,258 square feet of Class “A” professional office space for lease in Cherry Hill NJ at this Cherry Hill office building for lease. The asking lease price for this professional office space in Cherry Hill NJ is $10.00/sf NNN, This Cherry Hill professional office space for lease is available for immediate occupancy through Wolf Commercial Real Estate, a Cherry Hill commercial real estate broker that specializes in Cherry Hill commercial real estate listings and services. This Cherry Hill office building for lease at 111 Woodcrest Road Cherry Hill NJ is close proximity to Voorhees Town Center and this professional office space for lease in Cherry Hill NJ also is close by numerous other amenities. Located in a two-story Cherry Hill office building for lease, this professional office space in Cherry Hill NJ has exceptional corporate neighbors. 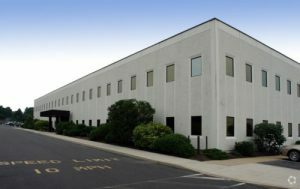 The neighbors near this Cherry Hill office space for lease include Hewlett Packard and American Water Company. This Cherry Hill professional office space for lease is now available through Wolf Commercial Real Estate, a Cherry Hill commercial real estate brokerage firm with expertise in Cherry Hill commercial real estate listings and services. This Cherry Hill office building for lease at 111 Woodcrest Road Cherry Hill NJ has an open and efficient floor plan. There is common access to the lobby, restrooms and elevator at this professional office space for lease in Cherry Hill NJ. This professional office space in Cherry Hill NJ is landscaped. This Cherry Hill office space for lease has immediate access to I-295 via exits 31 and 32 and has direct access to the Woodcrest PATCO High Speed Line Station. Parking is plentiful at this Cherry Hill office building for lease, with a ratio of 5/1,000 sf. The building containing this Cherry Hill professional office space for lease is visible from both the road and the PATCO High Speed Line. More than 268,000 residents live within a five-mile radius of this professional office space for lease in Cherry Hill NJ and the average household income in the same area is $87,718. For more information about this Cherry Hill office space for lease at 111 Woodcrest Road Cherry Hill NJ or about other Cherry Hill commercial properties for sale or lease, please contact Jason Wolf (856-857-6301; jason.wolf@wolfcre.com) at Wolf Commercial Real Estate, a Cherry Hill commercial real estate broker.